The rosy glow is both my nose and the colour of my top. No shots of me today, I look like Rudolph! 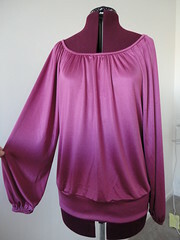 My top is Vogue 8581, view C - size 12, made up in silk jersey from Gorgeous Fabrics. This top feels so good - all sensuous and slinky. This is an easy pattern, but I felt like the proportions and the directions were all over the place. Like so many others I sewed the front, back and sleeves and then did the gathering all in one go. I also folded the neckband in half, sewed it on and then sewed it down by hand. I had planned on stitching in the ditch, but my machine didn't like the gathered silk and kept pulling it down into the bobbin case. I switched out the sleeve binding for an elastic casing - much quicker and easier, but I removed the elastic casing on the bottom and went with a wide band. Someone on Pattern Review suggested doing the same thing for the neckline which would make it quicker and easier again. In terms of the proportions I added 2 inches to the sleeves and I still feel like they're too short, another couple of inches would feel better. I needed to add an additional 3 inches to have the bust point and the waistline in the right places, but I then had to take 7.5 inches off the length which I folded in half to make the bottom band. So basically I added the length at the waist and removed it from the hem, or there abouts. I also narrowed the sleeves, mine are wide and straight rather than bell shaped like the pattern - my fabric just wasn't wide enough but I wouldn't want the sleeves any fuller. Next up should be a Vogue coat. There's still plenty of cold weather ahead yet and I figure the best way to deal with it is to make myself some great clothes. 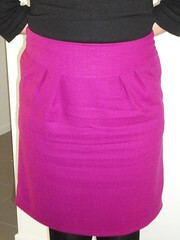 In an effort to brighten up our gloomy Melbourne winter I made myself a fuchsia skirt. The pattern is Simplicity 2451 - I'd seen lots of lovely versions and I wanted to give it a try. It's such a basic pattern, goes together really quickly and everything matches up nicely. It even has pockets! Sorry about the wrinkles - I'd been wearing it all day at work. The fabric has been hanging about in my stash for a couple of years. This is not a colour I tend to wear a lot - in fact as much as I love bright colours I rarely wear them. I pulled it out thinking that I'd make this skirt and hubby told me he hated it and to give the fabric away. Thankfully I ran the idea past my sister when she was visiting and she told me to go for it (thanks Sis). Hubby saw me trying it on to check the hem length...and he really likes it! Moral of this story? When it comes to sewing, listen to your sister, not your husband. My only concern with this pattern is the side view. I love the look of the front pleats but they do add a bit of volume in the tummy area, which is one area I really don't want to look any bigger. The skirt got quite a few compliments at work and it makes me smile, so I'm counting it as a winner. An update on Frank - my mixed pattern dress - it's also received quite a few compliments at work and is really comfortable. Nearly done - Paige cracks me up. It's the posing - she gives you a front, side and back view and you have to take pictures of them all. 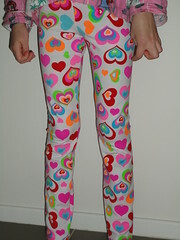 She requested some new leggings as one of her birthday gifts. 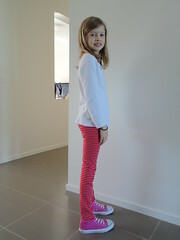 She picked the fabrics from the stash and the trusty Ottobre leggings pattern got a work out. Ok I'm off to cut out a Vogue pattern before my Supernatural marathon tonight. Have a good weekend. 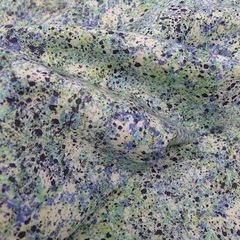 For all those Liberty lovers out there - Jorth is having a fabric giveaway to celebrate her birthday. And if you don't love free fabric pop over anyway because her blog is always a great read. Please don't think I'm telling you this for your benefit, oh no, blogging the giveaway gives me an extra entry! I've been working away at this dress for a bit over a week. 10 minutes here and 20 minutes there and I finally got some time to finish it off today. It's the top of Simplicity 2281 and the bottom of Vogue 8685, with a couple of changes. Simplicity 2281 is supposed to be made up in a woven fabric and I've used a stretchy rayon knit﻿. I was playing with my patterns and my fabrics and I really liked the idea of using this teal knit for the top. I cut view B in a size 14, omitted the zip, extended the neck ties and added an elastic casing for the cuffs. I also needed to cut about 1.5 inches off the bottom of the bodice piece as the weight from the skirt section pulled it too low. Sorry - this is a really crappy picture. I must admit the dress looks better on me than it does on Ruby. 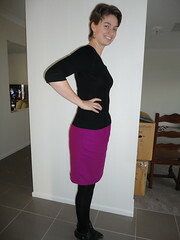 I really liked the panelled pieces of Vogue 8685 so decided to just use them again, this time in a black ponte knit. Overall I'm really happy with the way the dress turned out and I can't wait to wear it. I think Simplicity 2281 is a great pattern and will probably make it up properly at some stage, but if you're thinking of making you might want to keep an eye on the neck ties. In a woven you cut it on the bias, interface and attach it. I found it difficult to get the ties to fit the neckline as marked and that was using a stretchy knit and also that they're not very long. One other thing is the back neck opening, it does fall open a little bit even when the ties are quite tightly tied. If that's likely to bother you it might be worth using some interfacing. I'm off to bed. Have to keep up my strength so that I can host a second child's party in 3 days, at least this one is at a play centre. I had 16 12yo at my house on Friday night and boy can they make a lot of noise! Another Me-Made month has finished and this time I feel relief rather than pride. Why? I hadn't realised how few me-made winter clothes I own and I really struggled with wearing the same small selection over and over. One of the things I love about the Flickr group is the inspiration you get from others and I felt like I wasn't contributing to that. Similarly, I found myself wanting to whip up something new, just to have something new to show, rather than something that would be a great addition to my wardrobe. Does anybody else ever fall into this trap? After moping about how unproductive I've been during June, I've given myself a good shake and come up with a bit of a plan. I've traced out a number of patterns (Ottobre and Burda) and I've got a number of wardrobe gaps that need filling. So I'm going to fill some of those gaps, make up the traced patterns and if I happen to feel like sewing something completely inappropriate (like a summer dress) then I'm just going to do it. Sewing is supposed to be enjoyable, not something I worry about. A big thank you to those of you who provided assistance with my commenting problems - I think I've got it sorted.